We are creating a slide show which includes photos of each senior athlete on L-S teams. In order to include all athletes, we are depending on parents to supply these photos. · Please send no more than( 3 )photos of your senior athlete across all sports. *Please email digital photos to by April 24, 2018. NOT embedded in an email in the largest digital size possible. The slide show is the highlight of the evening and athletes are always thrilled to see themselves and friends in the video. So, please be sure your athlete is included. Thank you for helping to make this event a success as we celebrate our athletes and their commitment, effort, camaraderie and sportsmanship. Click here for photos from the 2017 Senior Banquet! 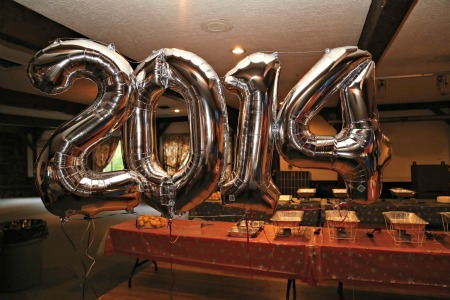 The 2014 Banquet was held on Tuesday, May 20 from 7:00-9:30 PM at the Maynard Rod and Gun Club. A sumptuous Italian spread was catered by Juliana's. After dinner, comedian Jim Colliton had the audience in stitches.